By studying the ins and outs of companies that enjoy extraordinary loyalty from customers and employees, John Jantsch reveals the systematic path to discovering and generating genuine commitment. Jantsch's approach is built on three foundational planks, which he calls the clarity path, the culture patron, and the customer promise. 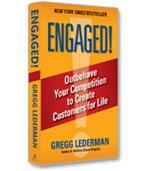 A business cannot succeed if its leaders and employees are not fully committed to that success. 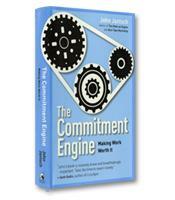 John Jantsch, the author of Duct Tape Marketing and The Referral Engine, lays down a manual for total commitment within companies and organizations in his newest book, The Commitment Engine. This manual is based on three elements that the author calls the clarity path, the culture patron and the community promise. As Jantsch explains: "Businesses that run so smoothly as to seem self-managed aren’t normal. In fact, they are terribly counterintuitive, but terribly simple as it turns out. The key is to focus all your energy on only three things: clarity, culture and community." Commitment begins with clarity, Jantsch writes. You have to be clear on what your business does better than anybody else and why you have a passion for your business. Jantsch suggests first developing a passion mantra — a succinct statement of purpose — based on three questions: What do you want in your life? What don’t you want in your life? What are you willing to give up in order to have what you want? Once a mantra is developed, he writes, you must stay "connected to the words in the mantra, carrying it into every business situation and using it as a filter for decision-making." Jantsch himself has a mantra that he uses whenever he starts to feel tired or unmotivated. The mantra: "My life is an amazing adventure; my business is an amazing adventure." Clarity of purpose not only applies to the individual, but to the business as well. The purpose of a business, Jantsch writes, is to have a "higher purpose." Companies such as Southwest or Zappos are successful because they each have a higher purpose — Southwest intends to make flying fun; Zappos sells happiness as well as shoes. Finally, Jantsch writes, a "fully alive" corporation will have a clear personality. The value proposition of a company is how you deliver on purpose, but personality, he notes, "is how the world experiences your purpose." Every fully alive business will have the following seven personality traits, according to Jantsch: inspiration, innovation, play, community, convenience, simplicity and surprise. Shared stories. Great leaders use stories to inspire and unite their people. Shared beliefs. People want to work for something that they believe in and for those who share those beliefs. Shared purpose. Leaders must bring to life the purpose of the company for their staff. The final piece of the author’s commitment "engine" is the Community Promise. As with building a culture of commitment, telling stories is also a key practice for building a committed community. While the culture stories were intended to help motivate internal staff, Jantsch writes, "we now need to turn our attention to the story building that you use publicly as a vehicle for attracting like-minded community members and customers." Another important practice for building a community is to turn your business into a platform — to position your business so that it can be "a system that helps people create products, services, profits, businesses, communities, and networks of their own," Jantsch writes. Thus, through Amazon Web Services, the retailer enables thousands of businesses to build on Amazon’s innovative and extraordinarily efficient framework. The Commitment Engine is a compelling and comprehensive framework that will guide business leaders in keeping the entire community of their enterprise focused on a single-minded, value-creating higher purpose of the business.